Anytime you perform a breast biopsy there are three possible outcomes. The result may come back completely benign, in which nothing further needs to be done. Alternatively, on the other end of spectrum, the biopsy may reveal malignancy. Both of these outcomes are fairly straightforward. When you do a biopsy, occasionally you will get a third outcome. The result will be Atypical. Meaning, not normal yet not breast cancer. There are many pathologic entities that fall into this Atypical or High Risk bucket. The bucket of high risk or atypical lesions includes things like ADH, ALH, papilloma, radial scar and more. There are two important concepts to understand when looking at why these pathologies are considered high risk. When you are performing a percutaneous needle biopsy, you are taking a few small samples through a breast mass or grouping of calcifications, enough to get the diagnosis. Your goal is not to remove the whole lesion. What can occasionally happen is undersampling -- meaning that if the entire lesion is surgically removed, cancer cells may be identified. This happens in part because many breast lesions are very heterogeneous and you may only sample a portion of it. Only certain breast lesions have any significant upgrade rate. If you biopsy a benign fibroadenoma, there is really no risk of it being upgraded to malignancy if the entire mass was removed. This is why fibroadenomas are not routinely excised. 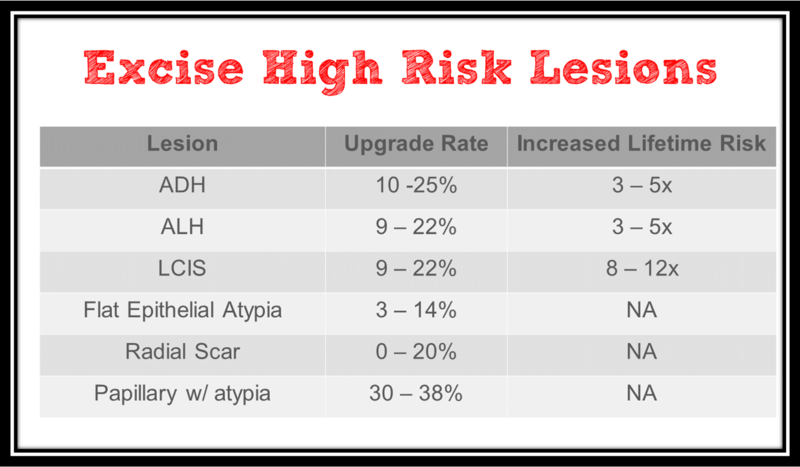 However, many High Risk lesions carry a significant upgrade rate and therefore surgical excision is recommended for these pathologic entities. The other main issue with high risk lesions is that many of them can turn into a breast cancer in the future if left in place. Additionally, some of the high risk lesions indicate an overall increased risk of developing breast cancer, not only at the biopsy site but a global increased risk. It can be helpful to think of these atypical pathologies as "cells behaving badly." Having these cells around can increase your risk of future malignancy. The image above shows two distinct pathways to developing breast cancer. All of the following pathologies are benign (not cancer), but require surgical excision due to their significant upgrade rate or due to the fact that they increase one's lifetime risk. 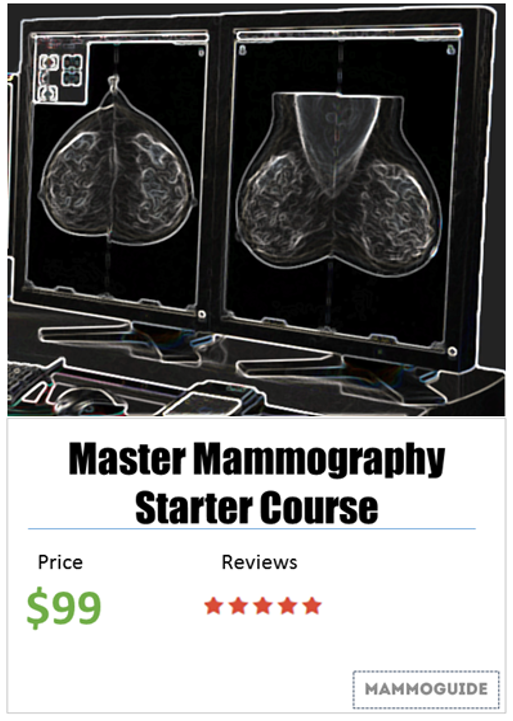 Ensuring that appropriate management is performed is the final step of any breast biopsy. Increased layers of "funky" looking epithelial cells in the TDLU (Terminal Duct Lobular Unit). Has a significant upgrade rate. Increases ones lifetime risk of breast cancer. Categorized as Lobular Neoplasia, small discohesive cells may be found incidentally at biopsy. Partial involvement of the lobule. Increases ones lifetime risk of breast cancer (bilaterally). > 1/2 of the lobule is involved. Categorized as Lobular Neoplasia, more aggressive subtype that is often strongly Her2+. Increases ones lifetime risk of breast cancer, but also has a high rate of recurrence. Also known as columnar cell change with atypia. Low grade cytologic atypia, frequently found incidentally at biopsy. Has a low upgrade rate (but often found in presence of other high risk lesions). Slight increase in ones lifetime risk of breast cancer. Stellate lesion with a central elastotic core, maintains myoepithelial layer. Minimal, if any increase in lifetime risk of breast cancer. Benign intraductal proliferation with a fibrovascular core. Controversial if need to remove every intraductal papilloma (? only remove if > 1.5 cm in size). 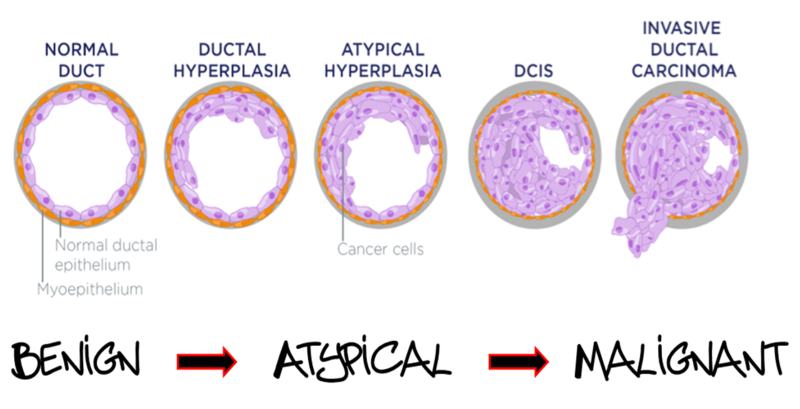 All papillary lesions with atypia need to be removed. Variable upgrade rate (essentially zero if no atypia) due to undersampling & heterogeneity. Here are a few other less common atypical or benign (but not malignant) breast lesions that require surgical excision if discovered on a core biopsy. Difficult to distinguish from the common benign fibroadenoma with a cellular stroma. Most are benign but can grow quickly and to a very large size. 1 out of 10 is a malignant Phyllodes (acts and treated more like a sarcoma). High rate of local recurrence so excision with wide margins recommended. Mucin within the breast stroma, usually due to a ruptured duct. Significant risk of underdiagnosis & difficult to distinguish from mucinous carcinoma. Locally aggressive stromal tumors. No risk of metastasis. Require wide excision to prevent recurrence. Rare neoplastic growth from peripheral nerve Schwann cells. Usually benign, but occasionally co-existing malignancy. Diagnosis may change to ADH, ALH or LCIS at surgical excision. Check out our comprehensive video courses to learn more.